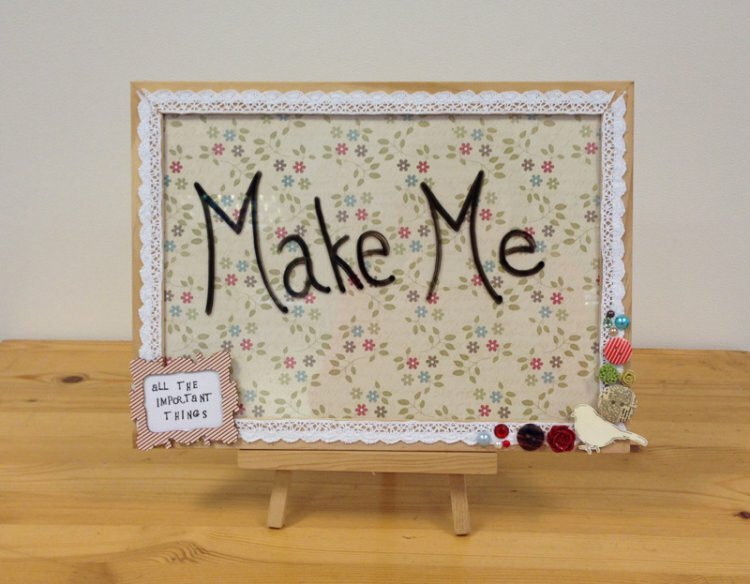 Today we are turning an ordinary and inexpensive picture frame into a fab notice board perfect for scribbling down all those important notes. 1. Choose a paper design you would like for your frame and cut it to A4 size, put it inside your frame so the design is behind the glass. 2. Trim 4 lengths of lace ribbon to fit your frame, cut the corners to points so they fit flush together , stick a strip of double sided tape around the inside edge of the frame and attach the lace ribbon to the frame. 3. Using silicone glue (or a hot glue gun) arrange a selection of buttons, shapes, gems and flowers in the bottom right hand corner of your frame. 4. Stamp a sentiment on a piece of white card, trim and fix to the back of a wooden frame, glue the frame to the bottom left hand corner of your notice board. Now you can use a white board marker to jot down all your important memos and when the job is done just wipe it away and start again. If you like this project then leave us a comment below, why not show us your own versions in the project gallery.